St. Clair McKelway came from a family of newspaper journalists and ministers. Born in 1905, in Charlotte, NC, he grew up in Washington, DC, and worked his first job as an office boy at the old Washington Times-Herald. 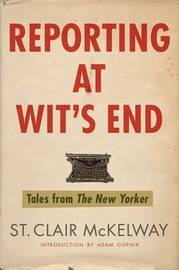 He went on to report and edit for the New York World, the New York Herald Tribune, and the Chicago Tribune. He eventually became a staff writer at the New Yorker, where he wrote for thirty years, and its managing editor from 1936-1939. He married five times, each of the marriages ending in divorce, and died in 1980 at the age of 74.